Our Private Parks and Pipes™ are built with one thing in mind. That thing is PROGRESSION. A variety of features ranging from small to large can be found in our lane at any point of the summer! All of which have been meticulously maintained by our crew of Diggers™ that rake EVERY feature twice a day. Jumps – small bumps to medium jumps, and large step-overs. Rails & Boxes – simple rails and boxes, kinks, close-outs, ledges. Our continuously evolving Private Parks and Pipes™ has set the stage for snowboarding’s progression for 25 years. More tricks have been learned, invented and enjoyed on this stretch of snow than any other on Earth. From Peter Line’s back rodeos to Bode Merrill’s back 7 one-footers, our Private Parks and Pipes™ is home to legendary tricks and people. Although you can lap the Private Parks and Pipes™ on the high-speed quad too – most choose to ride our two private rope-tows, and some folks even like to hike specific features. No matter how you choose get up the hill, you’re gonna have a blast on the way down. It’s Super. It’s a Pipe. It’s a Superpipe! The HCSC Superpipe is the only pipe of it’s size (Olympic 22 ft.) and quality anywhere in the Northern Hemisphere during the months of June, July and August. Olympic teams from all over the world come to ride in our park every summer. And this beast doesn’t just run for a couple weeks, it lasts all summer long! 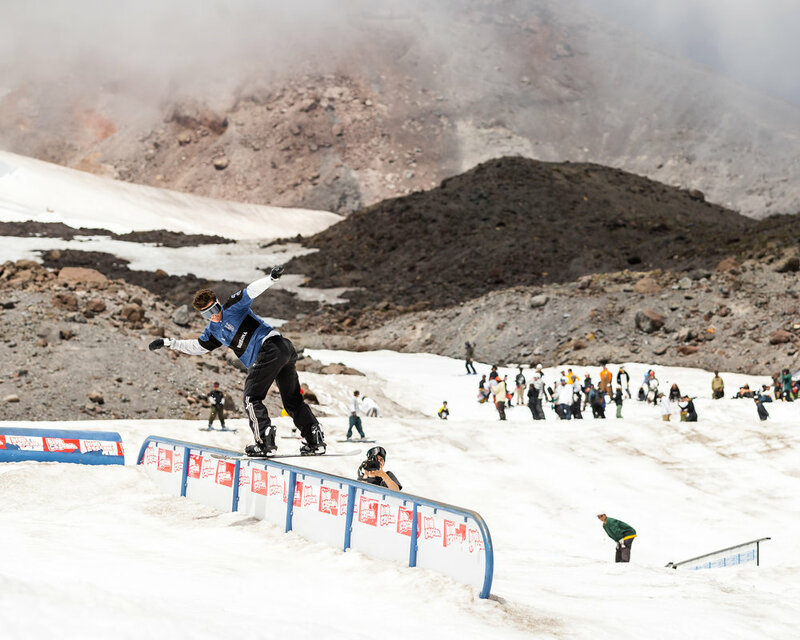 Summer home to the U.S. Snowboarding Team, HCSC’s Superpipe was also ridden by the Canadian, French, Russian, Japanese, Chinese, South Korean, and Australian national teams as they prepared for the 2014 and 2018 Winter Olympic Games in Sochi, Russia and Pyeongchang, South Korea . But don’t be intimidated, these Olympians are always more than happy to help get you to the lip of the pipe or take a bite off your sandwich! Halfpipes aren’t just for X-Games superstars and Olympic Medalists. . . that why we have "The People’s Pipe”, built for everyone else. Our Mini Pipe is 16ft tall, soft, and seems to have a spell cast on it helping you land any trick you try. No matter who you are, cruise in HCSC’s Mini Pipe and have a blast. Slashes, methods, handplants, old school grabs . . . do whatever you like. It’s easy and it’s fun. It’s also where pro boarder man Bode Merrill has his Merrill Mini Pipe Invitational (MMPI) for other pro boarders who are NOT pipe jocks. Each summer the world’s best non-pipe pros come to HCSC to ride in the MMPI and take pipe riding (not) seriously. It’s like jumping into a giant Marshmallow! Not just for backflips and triple corks, HCSC’s BAGJUMP™ is perfect for getting the feeling of being in the air without the consequences of a hard landing. Because our BAGJUMP™ is so soft and absorbs so much energy, you’ll gain confidence in your air-awareness (thanks Craig Kelly) which you can quickly take to real jumps on the next run. Jump into it > watch others > get coached > do it again. That’s how you learn. And you know what? It’s just plain fun to ride! Catch some air on our snowboard jumps! Between the nearly 15 jumps throughout our parks, you can learn your first grab on a five-foot table top jump, or watch Signature Session™ pro's float double corks on the 70 ft "Big Jump" (you can too with a couple summers at HCSC!). No matter what level you’re at, there’s a jump with your name on it. Whether you’re working on grabs, spins, or just styling out a trick you learned on FDOH (first day on-hill), there’s a shaped jump for you. And unlike any other snowboard park, our jumps are hand raked 2-3 times each day by our crew of Diggers to make sure they ride as well at the end of the day as they did when the sun came up. The secret to getting better at anything is having fun and doing it over and over again. Your great grandpa who rode HCSC in the 1990’s will think you’ve got it easy nowadays with our two private rope tows. “Back in my day we had to hike for every bit of airtime . . . . and we liked it!” Or did he ever tell you that he had to walk in the snow, up-hill, 2 miles both ways to and from school? Well, ask any camper from before 2008 and they’ll tell you the same thing about riding in our park. We used to hike everything. That was then; today all you have to do is grab a handle and don’t let go until you get to the top; buckle your back binding and then shred the jumps, rails, and pipes over and over. It’s easy, makes the park more fun, and saves time, letting you ride the park as many times as you have energy for. Now that’s how you get better at snowboarding!